Designed and manufactured in Australia, ARB® air lockers feature a patented design which has earned a reputation for reliable performance both On and Off-Road. ARB Air Lockers are air operated and activating them is as simple as pushing a button mounted inside the vehicle. Each locker includes a pre-assembled differential carrier, air hose, air fittings, solenoid valve, steel housing tube, 2 on/off push buttons, 1 inner bearing, 1 inner bearing cap and all necessary installation hardware. Easy-to-follow installation instructions and illustrations are also included. 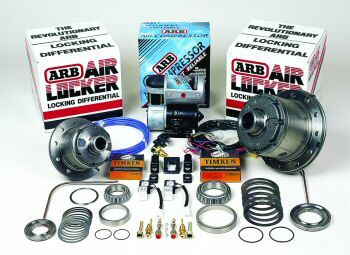 An air compressor (sold separately) is required to operate the ARB Airlocker. The ARB Air Compressor will operate a single or dual (front and rear) locker system. An optional tire inflation kit is also available. Each locker is covered by a 12 months or 12,000 mile manufacturers limited warranty.